thanks to help from friends of the earth, manor gardens allotments have now gone to court over the failure of the lda to make good the promises of an alternative location, and the proposed eviction has been postponed to july. of course they don't want to move, and what could be a better centerpiece for what claims to be a green olympics than a thriving set of green plots in the centre of the site. the allotments are on a narrow band of land between the river lea and the channelsea river (more of a ditch at the moment.) it isn't in any way an essential site for the olympic plans, forming a part of a footpath that could easily be routed around either side, with a smaller 'observation path' leading through the showpiece allotments. of course, part of the charm of the allotments at the moment is that they are a little run-down and the plot-holders huts have a very personal and rather heath-robinson quality. a still life photographer could spend their life here and never exhaust the subject matter. a very small amount of funding (much less than that involved in relocation) could help to tidy up the area without losing its individual quality. it would even be possible to add some commercial showpiece plots at the southern end of the site (formerly a nature reserve) which could generate some income for the games, making a small, but rather more green vegetable equivalent of chelsea. however, the lda seems to lack the vision required for this, as well as the competence to carry out the promises it made originally about finding an alternative site. currently the best they seem able to offer is a yard in which plot holders will be able to store plants in pots and come and water them occasionally. let's hope the court will make them think differently. 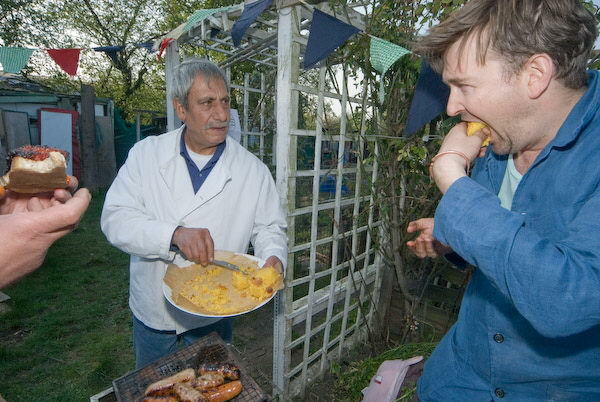 it was the first time i've visited the site in fine weather, and it was a great afternoon, with some fine food from hassan and reg, as well as sam clark of moro. i ended the by drinking a toast to manor gardens, champagne from a tea-cup. although understandably some plot holders haven't wanted to work their plots with the threat of eviction over their heads, but there was evidence of a lot of work clearing and planting since my last visit 4 weeks ago, and there were some people taking advantage of today's fine weather to get on with the job. 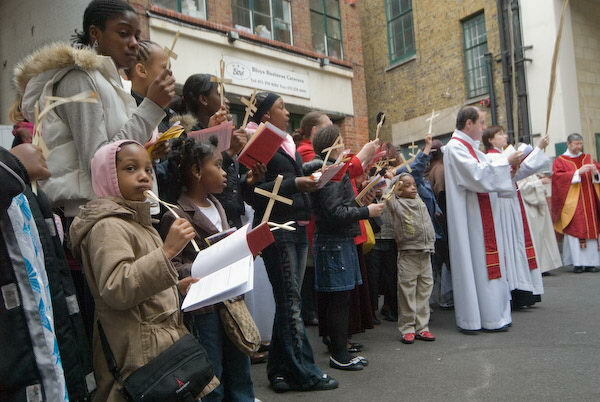 palm sunday was a very special day for the congregation of st george the martyr in southwark. this historic church (with strong associations with charles dickens who lived nearby and whose father was imprisoned in the marshalsea prison a few yards away) was found to be in danger of collapse in 2000, and required a major underpinning. fortunately the heritage lottery fund came to its rescue, and extensive works have been in progress. 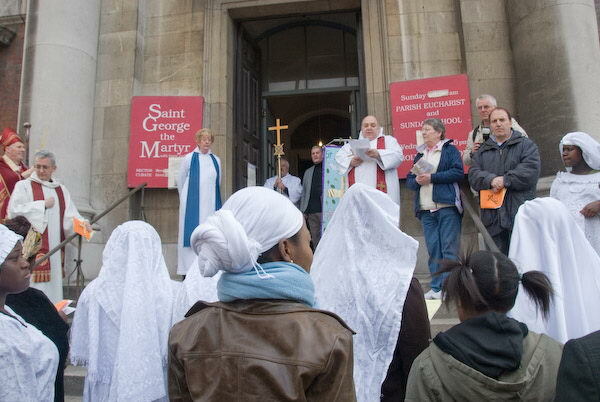 the church was closed in september 2005, and worship, including that of the cherubim and seraphim church which shares the building, moved to the chapel in nearby guy's hospital. 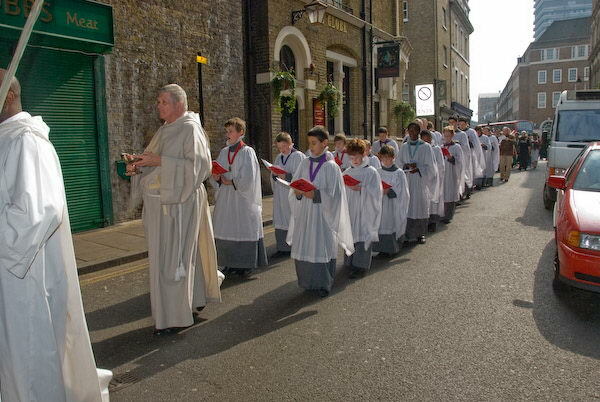 although the church is still surrounded by hoardings, the interior is now safe, and the congregation moved back in a procession on palm sunday, 1 april, meeting at guy's chapel and walking back in procession, accompanied by the the right rev christopher chessun, bishop of woolwich. 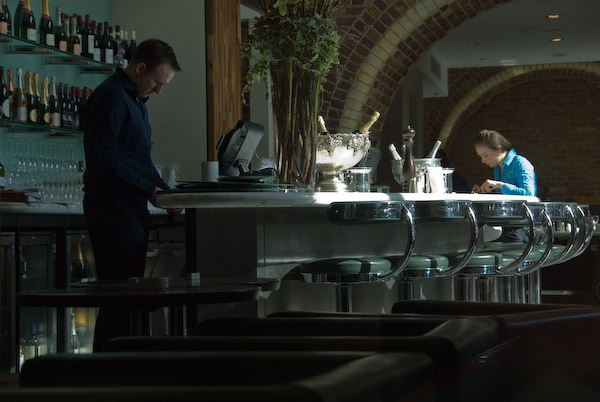 at the north end of borough high street is southwark cathedral and borough market, and on palm sunday the cathedral starts its service in the market before processing back to the cathedral. as might be expected, there are rather more people at the cathedral's service, and a large choir along with musicians. in some ways it's more of a spectacle, but i find st george's more appealing. 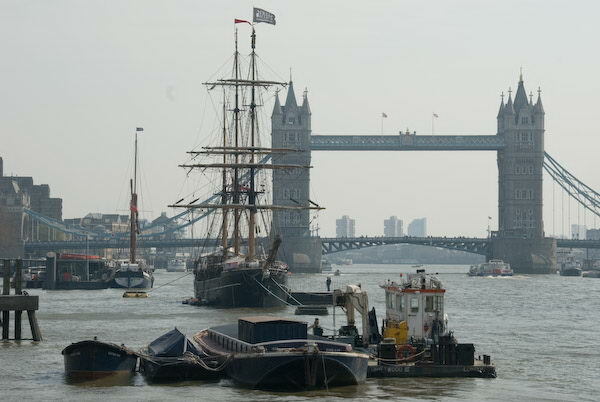 after the procession has entered the cathedral i walked around the area a bit before crossing london bridge to take a closer look at the replica slave ship moored off tower pier. the zong became the subject of a notorious case when slaves were thrown overboard to drown because the ship was in danger of sinking. it was a case that gave the british public a considerable shock, making many realise the immorality of the trade in african people. 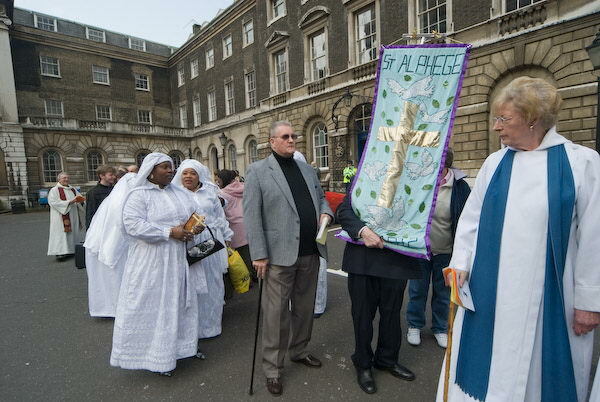 on good friday there were processions of witness and similar events in many areas of london. i managed to attend four very different events, all of which impressed me in some respects. my day started in north lambeth at 10am, where churches together gathered for a short service in the gardens at the front of the imperial war museum, before their walk of witness through the locality. after ahort services in a council estate, and the small neighbourhood park they met with others from st johns, waterloo for a service on the concourse of waterloo station, where i left them. a number 4 bus took me close to london's oldest church, st bartholomew the great in smithfield, where the butterworth charity was to be distributed. a member of the publishing company gave money in 1887 to ensure the continuation of the established custom of providing 6d (increased to 4s in the 1920s) to 21 poor widows of the parish, and buns to children who came to watch the proceedings. this year, no poor widows declared themselves and the buns were shared by all present. i left before the end of the service, and despite just missing a bus and a long wait, caught the end of the procession through islington to st mary's church. 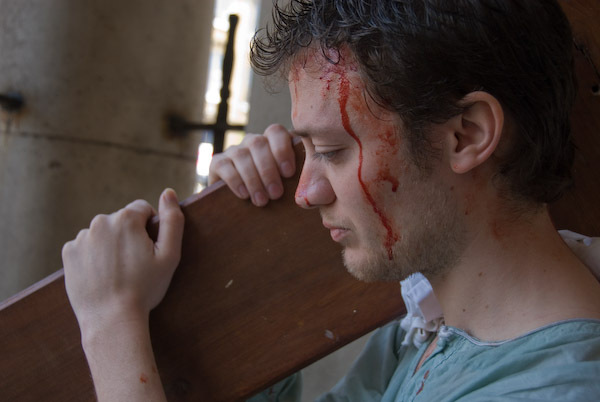 at first i failed to notice the large crowd making itw way along the busy pavement rather than the road, and the noisy surroundings drowned out the two drums behind the bloody carrier of the cross at its head. one of the women in the crowd behind had the best easter hat i met on the day, which contrasted rather with the sober black of her greek friend. another bus took us to archway. however it was held up in the queue of traffic behind the march there, so i arrived just as the service was starting. perhaps 200 people had assembled and a lively service followed. 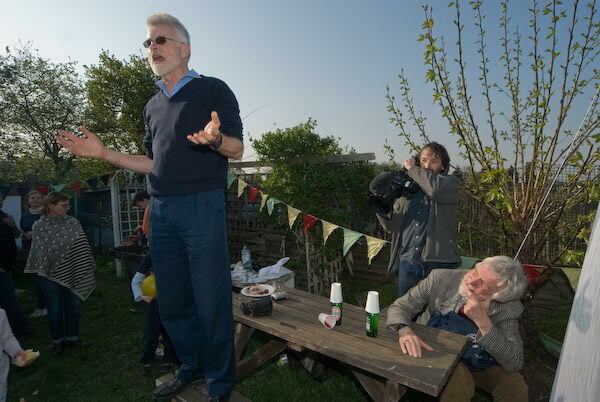 the singing improved when the generator ran out of petrol, and i felt moved to join in. from archway i took several buses to meet up with a friend in borough market, which in the past 10 years has transformed itself from dying old-fashioned fruit and veg business to catering for the an affluent mainly young foody market. there is an incredible range of produce on sale now, and some at incredible prices. some great stuff, some at surprisingly reasonable prices, but plenty of ripoff also. i'd come here mainly to meet one of my friends who was photographing the would-be trendy young who where fluttering around its flame. but it wasn't really my thing, and the nikon i use wasn't really the right tool for the job. saturday we had a day out from london, taking the train out to amberley, on the river arun just north of arundel. the route we were to walk came from a book, which said that in wet weather parts of the route could be muddy. it's been dry for a while, so i thought we might be ok.
after we got back, i checked up on another web site, which told me that the path through amberley wild brooks was impassable in wet weather. so we were lucky. further on the route passed a flood marker, just above head level, and the actual path went through a couple of fields close to the arun covered with a few inches of water. after wading through the first we detoured round the edge of the second, banked up slightly next to the ditch, followed by a dense cloud of midges that would have done scotland proud. part of the walk was along the south downs way, the walkers' motorway, which makes its ugly slash across the downs. it gives a good view of the castle. country life was going on as we walked, with an art show in the old school at rackham (some nice prints) and a flower festival in the church at greatham, as well as more agricultural pursuits. 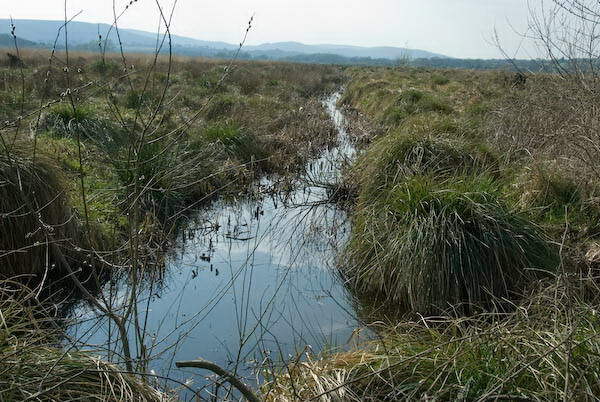 the amberley wild brooks, now a nature reserve were the highlight of the walk for me, and i'd happily have stayed longer in this strange landscape. we made a few small detours, some by accident, and by the time we got back to amberley station had certainly covered rather more than the intended 8.5 miles. the half-hour wait for the train home (its an hourly service) did at least give me time for a pint of the local brew. easter sunday i did take my camera with me to church, but didn't photograph there. after lunch we went on another walk, though i took my bike along so i didn't have to keep running to catch up with the others after i stopped to take a picture. our walk took us along the thames and around runnymede and coopers hill, where the trees were looking splendid. we paid a short visit to the magna carta memorial, and then walked up to the acre of america and the memorial for jfk, then continued up the hill and along the oak lane, into priest hill and then back along coopers hill lane. there were rabbits everywhere, but somehow i didn't bother to photograph them, though there were several who only scampered away after i'd stood only around 4 feet from them. we came back through the centre of egham, a small town which has kept its character rather better than its larger neighbour, staines. april seems to be a very religious month for me. 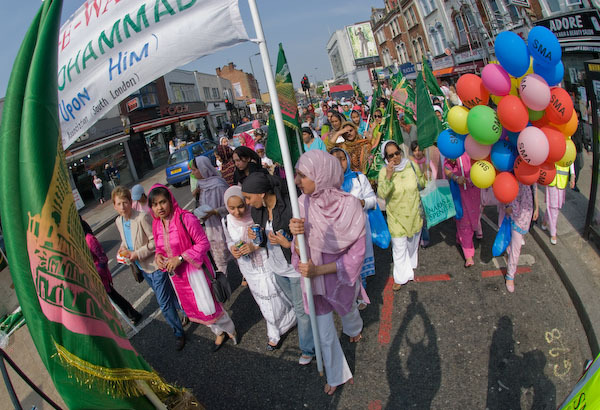 on saturday 15 i went to the celebration of the prophet's birthday organised by the sunni muslim association which included a juloos or procession from tooting bec common through tooting to the leisure centre in garratt lane. 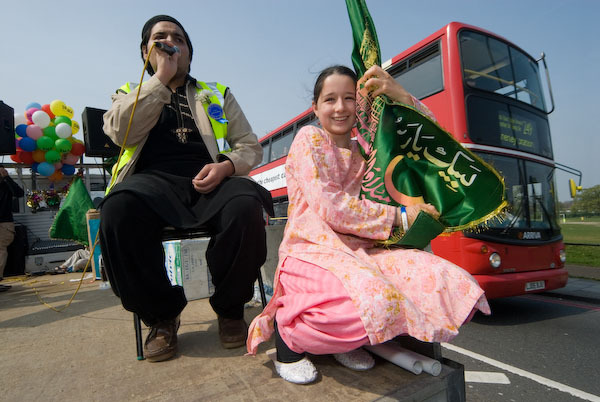 eid milad-un-nabi, or milad 2007, is an all-day community event and one that doesn't tolerate "political banners or activists". it was one of the friendliest events i've photographed, and as well as several hundred muslims, their were also honored guests including the mayor of wandsworth, various representatives of the police, of the fire service, a chaplain, someone from the local council of churches, the local conservative candidate and others. it was a hot day, and walking in the sun made it feel hotter. i was gload to arrive at the leisure centre and take off my shoes, and relax on the mat in the hall. it was just a little dark for taking pictures (and i'm still having to use an old flash unit while i wait for the new one to be returned from servicing) and both the whirling dervisheds and the islamic martial arts display presented a challenge, although the speakers were not too difficult. the speeches, in english, stressed the peaceful aspects of islam (and declared suicide bombing and violent demonstrations over the cartoons of the prophet as un-islamic.) perhaps the longest speech was by lord sheikh, a conservative life peer since 2006, chairman of the conservative Muslim Forum and also chairman of the conservative ethnic diversity council, who has had an extremely successful career in insurance since coming here from uganda. i left shortly after, and decided not to wait to pay homage to the holy relic of the prophet (peace be upon him) as i wasn't sure if i was in a suitable state of purity and cleanliness. probably not. but it had been a very positive and enjoyable day. i'd hoped to relax a bit on sunday, have a day off from working with a camera, catch up with things. 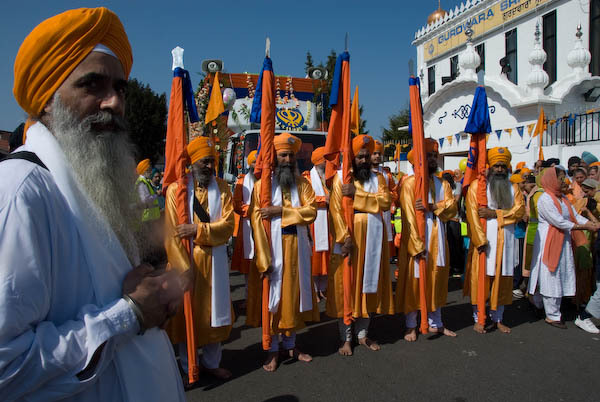 but linda heard something on the radio about vaisakhi in slough, so i looked on the web, found the procession started at 10.30 and jumped on my ancient bike. by then it was 10.15, and according to the aa the 9.5 miles should have taken me 27 minutes by car (and you could probably add a bit for parking etc onto that.) So 40 minutes wasn't too bad going, and i arrived just before the procession started to move off, just before 11.00am. by the time i left two hours later, the procession carrying the sikh holy scriptures and led as always by the khalsa carrying flags and swords was just around the corner a couple of hundred yards away in shaggy calf lane (though it had taken a rather longer route than me to get there) and as well as photographing the event and many of those taking part, i'd also had a very enjoyable free lunch. i made my way home rather more slowly. one of the great advantages of travelling by bike is that youcan stop exactly where you like to take photos. as well as a few buildings in slough, and what remains of a landmark garage at the west end of the colnbrook bypass (now sold and doubtless to be redeveloped) i spend some time in horton, which in my youth really was a country village, and still retains some of that feeling, before returning to staines via wraysbury. 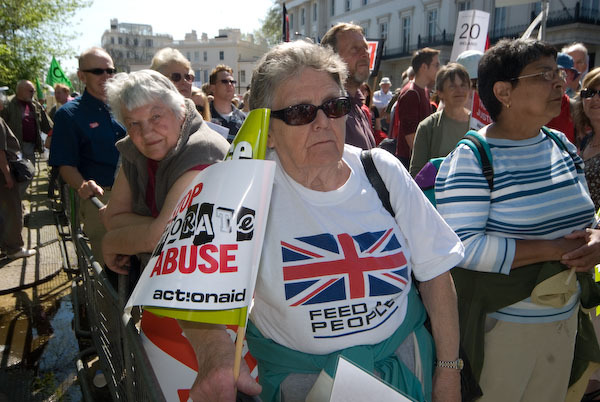 currently there are 78 uk-based organisations that belong to the trade justice movement, including aid organisations such as action aid, cafod, christian aid, oxfam, tearfund, war on want and the world development movement, trade unions, churches, fair trade groups and more. you can find a complete list on the movement site. 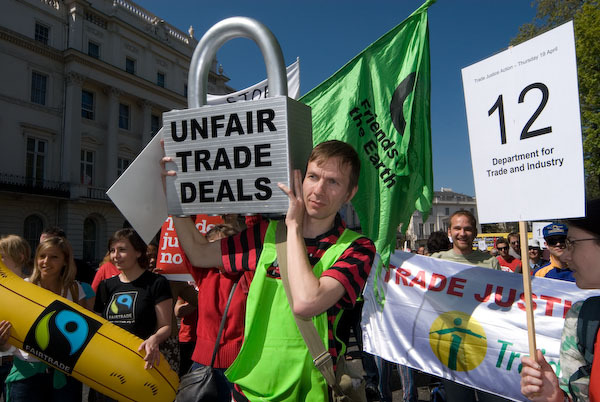 the tjm mass action on 19 april started with a rally outside the german (and austrian) embassies, from where groups went to every eu country's embassy with a letter and a key, demanding that the eu stops negotiating unfair trade deals (economic partnership agreements or epas) with developing countries. it was part of a global day of action by campaigners across europe, africa, the caribbean and the pacific - the 'apc' countries. as well as photographing the rally i also photographed outside the finnish, spanish and austrian embassies. saturday was another beautiful day, sunny, warm but not too hot, and the quintet with a fine singer created a mellow atmosphere as we gathered to plant two apple trees to celebrate 50 years of christian aid. the music included several of my ellingtonian favourites, there were some interesting home-made cakes, and it was great to relax for a while in the sun. the trees were given and planted by colin squire of squires garden centres, and as he commented, the cox's orange pippin was an appropriate choice, as not only is it a fine apple, but was first grown by richard cox just three miles away at colnbrook in 1830.
the two trees are in a public area, and we hope that in years to come the public will come and help themselves and enjoy their crop. mark thomas's latest twist to the mass lone demo was for demonstrators to set out a list of 20 demonstrations they would hold in the SOCPA area on saturday and to apply for permission for each of them. 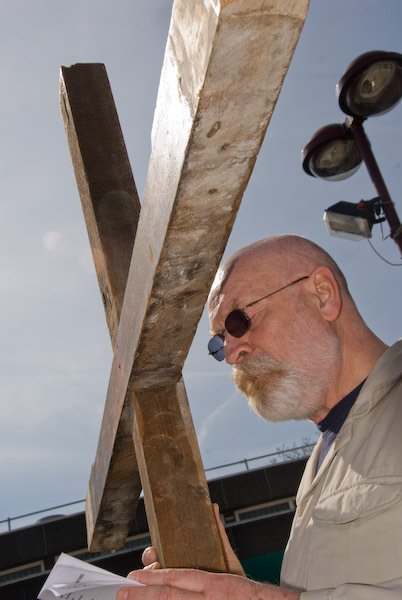 he was aiming for 2000 demonstrations (and hoping for an entry in the guinness book of records.) the police figure for the number of demonstrations that permission was applied for was 2,486, but it was actually quite hard to find many of them. i'd hoped to photograph people at such highly desirable sites for demos as the mothers union, the adam smith institute and the embassy of the republic of slovenia, but nobody was there when i looked. however i did find a few, but unfortunately had to miss the final event to get to kensington. 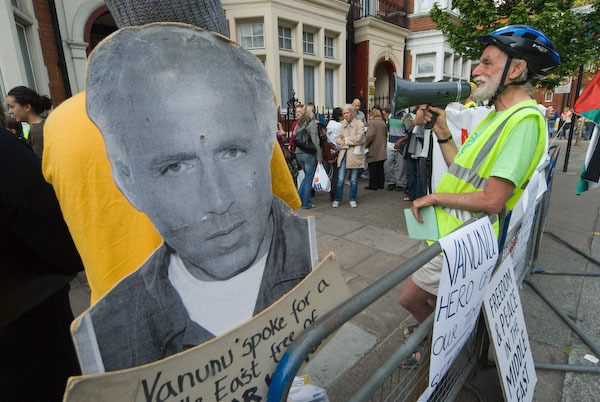 mordechai vanunu told the world about israel's nuclear weapons - still denied, still secret and still not subject to any international inspection. he worked on the program for 9 years until 1985, and in 1986 blew the whistle, talking to the press. days later he was lured to italy and kidnapped from there by the israeli secret service. convicted of treason in israel he spent 18 years in jail, 12 of them in solitary. released in 2004 he has been under severe restrictions on movement, who he can meet and what he can say. he would like to leave israle but it seems likely he will be sent back to prison. the ride demanded his freedom, the setting up of a nuclear-free middle east as well as freedom for palestine. the riders started at the faslane base to the west of glasgow where daily demonstrations are taking place outside the base of the ridiculous uk nuclear deterrent (ridiculous to have it, and in no way independent as we need us permission to use the weapons.) the ride stopped at many places on the way to demonstrate and hold meetings, including menwith hill spy station and lakenheath usaf base. they were met at hackney town hall by members of hackney & islington cnd and cnd vice-chair sophie bolt. 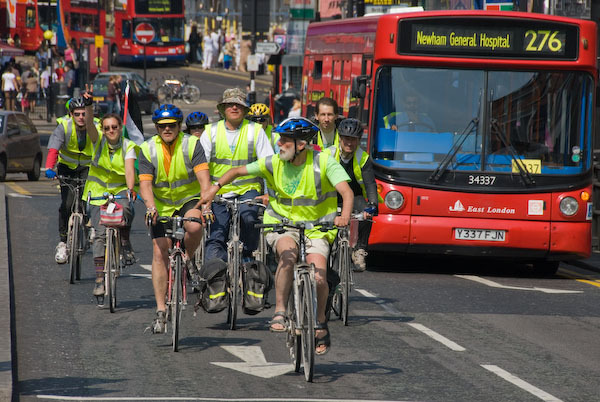 from hackney they cycled on via downing street to kensington, where there was a rally at which jeremy corbyn mp, kate hudson, cnd chair andlouise richards of war on want were among the speakers. 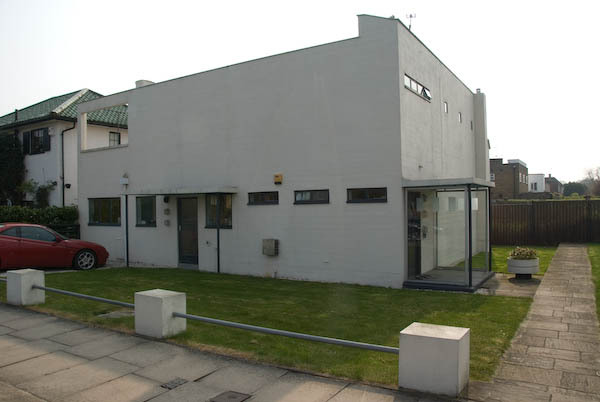 the israeli embassy in london is on a private street with security lodges at each end. cyclists are not allowed in the street, and demonstrations are certainly not tolerated. 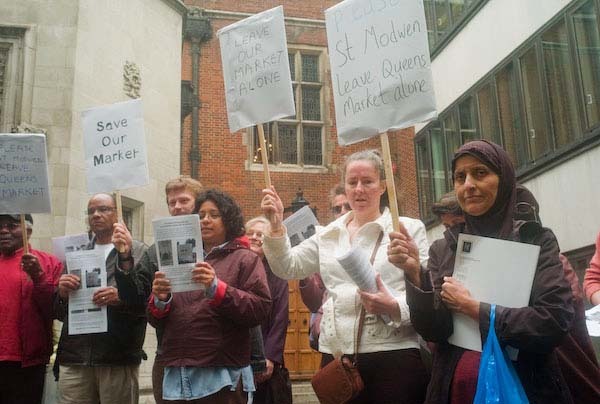 Friends of Queen's Market, who oppose the development plans for London's most ethnically diverse market, next to Upton Park tube station2727, today leafleted shareholders attending the annual meeting of developers Sy Modwen at Ironmongers' Hall in the City of London today. 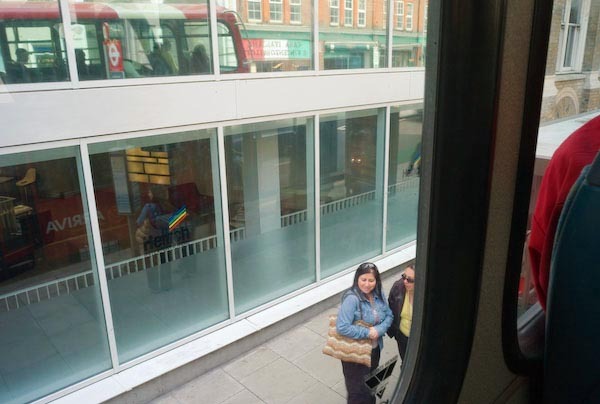 The development by Newham Council and St Modwen will freeze out many of the small shops and market traders that currently make this a lively and inexpensive place to shop. There will be less variety, with fewer stalls, shops and kiosks, and rents for shops and kiosks will be raised immediately the development opens (St Modwen have promised to freeze those for the reduced number of stall holders for 5 years), and all traders will have to pay an increased service charge. Locals don't want the higher prices and less variety and choice this development will inevitably lead to, and together with the local Conservative Party, Liberal Democrats, Green Party, Christian People's Alliance and Respect they oppose it. Last October women in the area organised a protest march, with strong support from all the communities in the area. 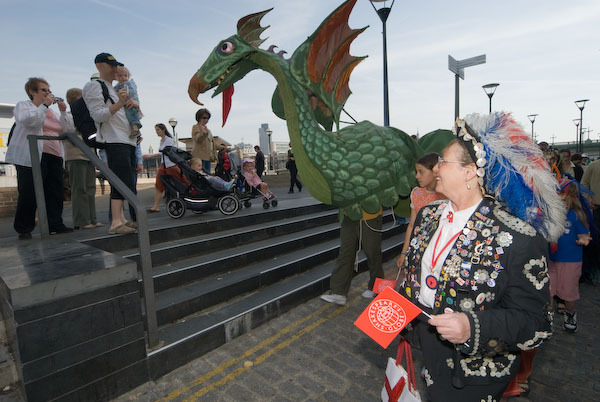 Newham Council is dominated by an old-fashioned corporate Labour group who have some monstrous planning fiascos in their past. Stratford Market, once something the area could be proud of and a vital centre to the town is now a nightmare shopping experience. Many of those entering the shareholders' meeting seemed unaware of what was going on. The protestors want both the board an the shareholders to become fully aware of the facts of the development - and the bad publicity that St Modwen has already earned from its involvement, which can only get worse. Queen's Market is in need of improvement. If this scheme goes ahead it won't get it. Asda Wal-Mart, previously a partner in the development, realised in June 2006 it was backing a loser and pulled out. Continued involvement by St Modwen will not only be bad for Upton Park but may also blight their other development projects. animal rights protests happen frequently on the streets of london and i can't cover all of them. many are rather small and local. 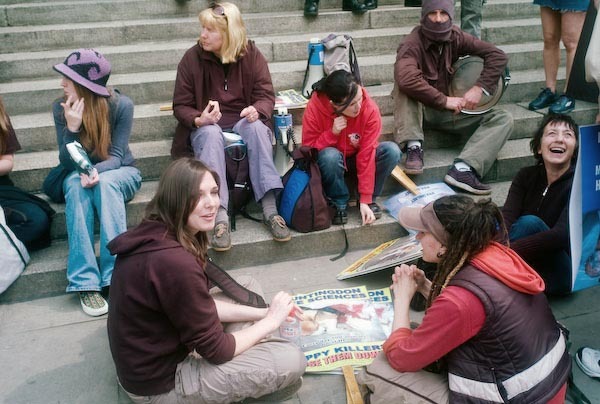 four groups of protestors met together for a rally outside royal exchange before leaving for protests in the city and elsewhere. i'm against cruelty to animals, but can't agree with the activists over our use of animals in producing food - though i would like to see much stronger legislation to avoid inhumane conditions of production and the kind of gross overcrowding of agribusiness. but i'm not a vegetarian or vegan. chislehurst isn't far from the centre of london but is surrounded by woods and commons and feels very different to hither green a couple of stations closer to the centre. even as a suburb it feels very rural, with what looks like a large village pond and village green. so getting publicity in the local area is very important. 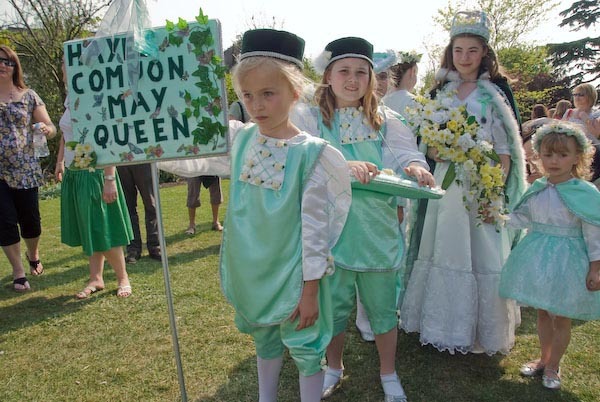 they need people to notice them and the may queen festival, and to bring their daughters and grand-daughters along to take part in the fun. obviously the girls who do take part are enjoying it, but it is also a committment and takes hard work to practice the maypole dances and so on. 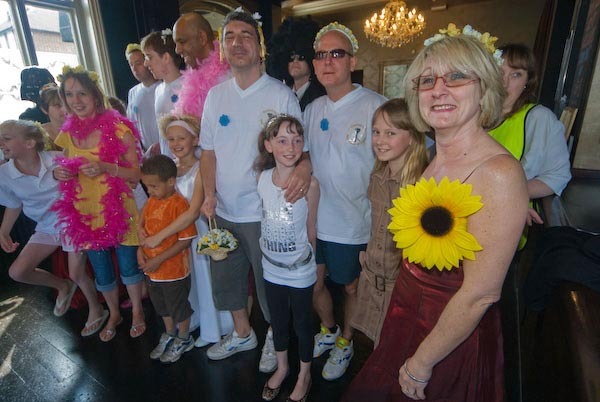 to get some publicity the week before the may queen festival they organised a sponsored fancy-dress pub crawl. i met up with them at the lounge, a fairly newly refurbished bar at the top of the hill to the north of the town centre, with an interesting decor. from there we went down into the centre of chislehurst, letting people know about the may queen and collecting money both on the street and in the pubs we visited. i was sorry to have to leave after the third pub, when perhaps things were beginning to warm up a little, but it was fun, and i hope will help to raise the profile of the may queen in the area. i'd promised this year's london may queen, erin, that i would try to photograph her, and unfortunately i have to be elsewhere for her actual crowning at hayes. so bromley seemed a good place to catch up with her and take some pictures, as there she would be appearing with five may queens from around the area - bromley common, shortlands, hayes, hayes common and hayes village. erin, this year's may queen, is easy to recognise as she is carrying a frame with pink roses and white flowers that says 'i am the rose of sharon and the lily of the valley, as well as a sash saying 'london may queen'. we got on the wrong bus to get to bromley and enjoyed a long tour of most of the outer reaches of south-east london before finally arriving. it didn't help that the address i had for the start was rather vague, but finally we met up with the procession almost exactly where we had got off the bus 15 minutes of wandering earlier, and walked with the procession through the centre of the town to the gardens. it was a shame that the police had apparently insisted that the procession rush through the town centre. it was led by the band of t s endeavour, playing 'when the saints go marching in' (and other popular tunes) and i'm sure they could have marched at half the pace without causing great traffic chaos - much of the centre is in any case pedestrianised. some of the younger girls taking part really had to run to keep up through the town centre. events such as this enliven towns (and bromley could do with an awful lot of enlivening, being total shopping hell) adding colour and individuality, and it seems far more important to celebrate them to the maximum than worry about traffic flow. at the gardens things were more relaxed, and the london may queen was able to crown those of the other queens who had not already been crowned at their own local ceremonies, and there were many pictures taken. again it's a shame that bromley doesn't have a maypole and there wasn't any singing or dancing or acting. but it was a nice summery afternoon and everyone seemed to be enjoying themselves. sunday was the international day of action for darfur, and although the demonstration in london was a relatively small one - perhaps a thousand people - the organisers had really managed to capture media attention. while anti-war or other marches of this size or even 50 times larger don't usually even rate a mention, this was a lead item on the mornings radio news - and listeners were even perhaps uniquely told when and where it was happening. i don't begrudge the publicity in any way. the situation is a world scandal and disaster and one that the nations are avoiding effective action on. as the posters, and the hour-glasses large and many small insist, time is running out, the blood is running out and time is up for darfur. it's just a shame that the media in general choose to turn their backs on other events. but today you could hardly move for tv cameras and photographers from what used to be fleet street. those freelances who cover the other demonstrations, small and large, that the papers and tv don't want to know about were also there of course. 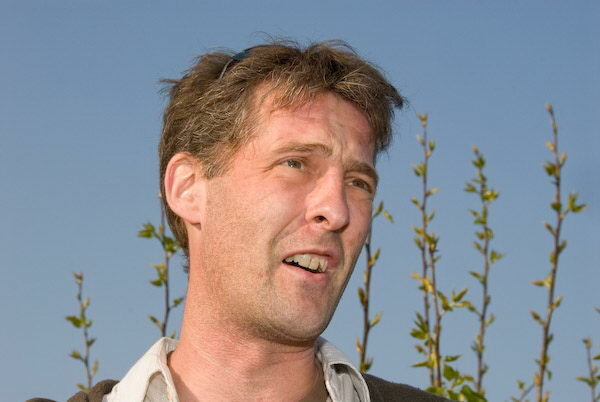 Legal action means Manor Gardens plot holders have until at least July to work their plots. Hassan brings round some of his great cake for Sam Clark, another fine chef. 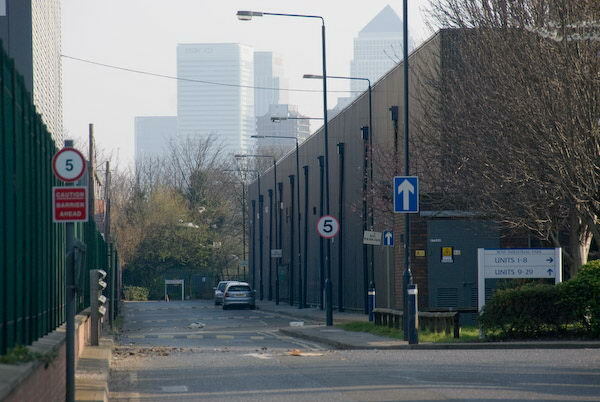 One area that will be no great loss when redeveloped for the Olympics, but hardly in need of regeneration. The congregation including the Cherubim and Seraphim Church leaving their temporary home at Guy's. And returning to their own church. The black Flag on the Zong reads "FREE AT Last?" 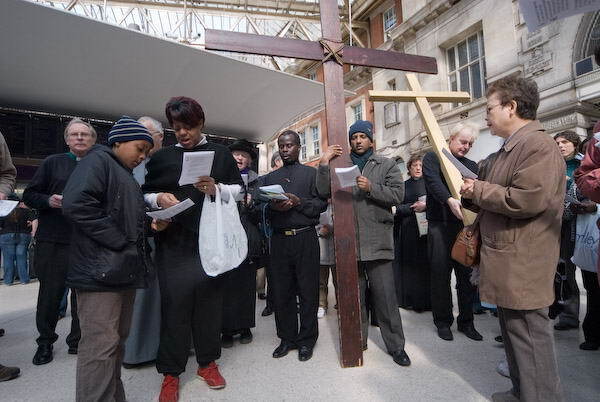 The walk of witness ended with a service on the concourse at Waterloo Station. 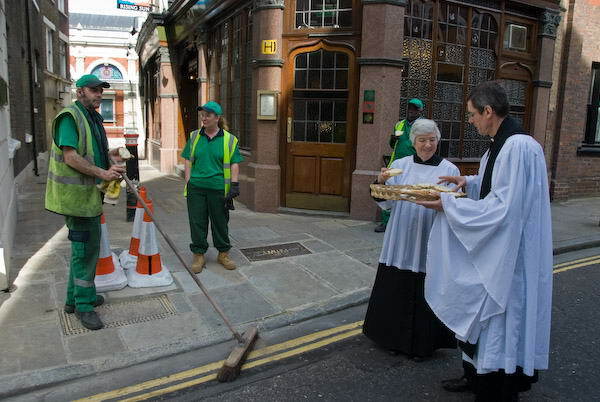 No poor widows came to claim their 4s (20p) but we all got hot cross buns, even the workers in the street next to the church. The procession followed a man carrying the cross. A sunny afternoon by the Thames in Staines. A startling design that still looks fresh over 70 years on. Sisters in the procession as it goes along Upper Tooting Road. 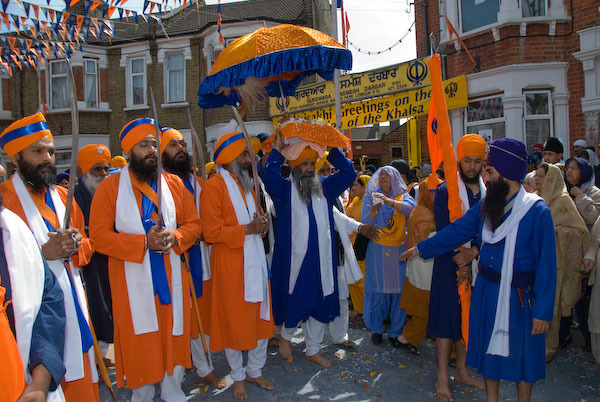 The procession forms up outside the Gurdwara. 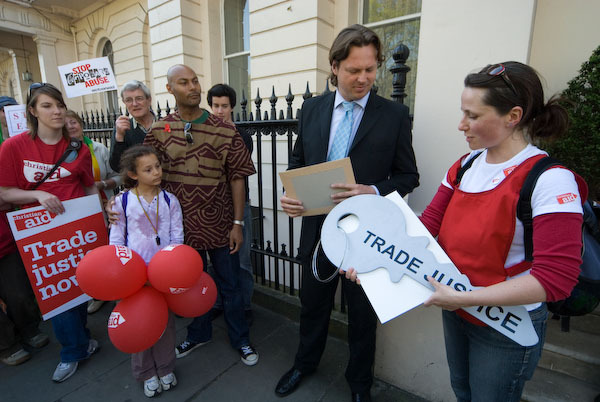 Handing over the letter and Trade Justice key at the Austrian embassy. 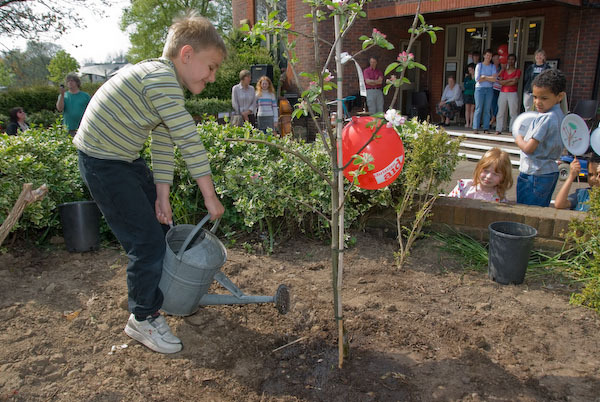 One of the 2 apple trees planted at Staines to celebrate 50 years of Christian Aid gets watered in. Freedom Riders in Hackney - they rode from Faslane nuclear base near Glasgow. A rally at the end of the ride at Notting Hill Gate, not far from the Israeli embassy. Starbucks in Victoria St - 3 of the over 2000 demonstrations. The Sikh holy scriptures, the Guru Granth Sahib being brought to join the procession. Friends of Queen's Market outside Ironmonger's Hall. The start of the pub crawl - inside The Lounge, Chislehurst. 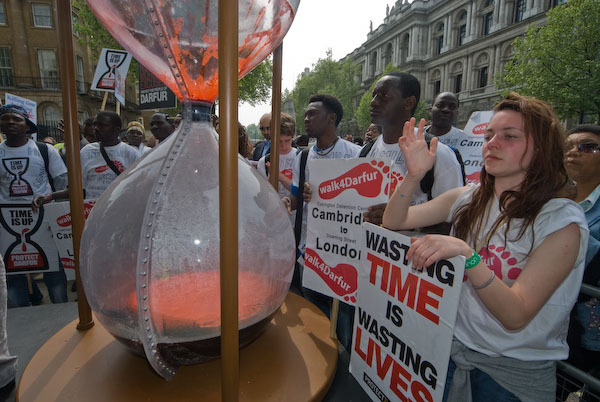 The hour glass signifies that time is running out for Darfur. Marchers from the walk 4 Darfur at the London rally.